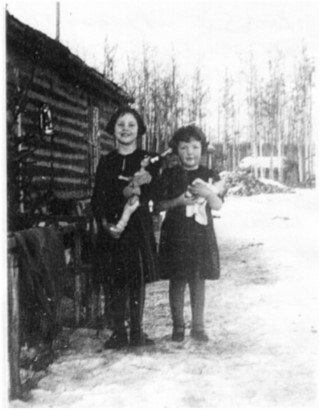 The Atamanenko sisters, with Gloria on the left. I was born near Fort Vermilion, Alberta, one hundred miles below the North West Territories boundary, in the farthest north farming district on the continent. Living on an isolated homestead during early childhood, I knew more about Ukraine, my parents’ country of origin, than I did about Canada. Winter lasted over seven cold, snow-bound months, and its long evenings were made interesting by Father reading out loud to his family. Mother and he had lively discussions, and there were more of those during visits with friends. History and politics were their strongest interests, because it was the difficult history and political situation of Ukraine that led to their immigration to Canada. Their readings, discussions, and the songs they sang told of bitter battles with various invaders. The warm climate and rich soil of Ukraine attracted invaders, and its lack of protective natural barriers made it easy to invade and difficult to defend. Mongolian hordes swept in from the east, and rapacious European neighbours from the north and west. In the twentieth century the autocratic, colonial regimes of the Austrian and Russian empires provoked perpetual Ukrainian struggles for freedom and independence. In the 1920s and 1930s, Northern Canada, despite its isolation and harsh climate, offered my parents the freedom and opportunities they longed for, and they loved it for that reason. They earned their homestead, learned English bit by bit, and became Canadian citizens, eligible to vote. It was election time. The bi-monthly visit of the boat that carried mail, passengers, and freight up and down 300 miles of the Peace River, brought campaign literature. The names below the photos of smiling candidates, and the names of the political parties they represented, were comprehensible, but most of the rest was not to people who were struggling to read English. The confusing mysteries of English spelling made learning to read that language without a teacher’s help very difficult. It became apparent that one of the candidates regretted that he would be unable to travel so far north. The representative of another party came, but confined his visit to the tiny town and to adjacent settlements that could be reached by one of the three automobiles in that corner of Alberta. The third candidate hired a team and wagon and struggled through the deep, muddy ruts of the road into our district. He arranged a Sunday afternoon meeting so that no one would need to take time off from the pressing load of springtime chores. Ukrainian Canadians were excellent farmers, the candidate told us. We were pioneers! We were opening the far north for agriculture. Canada needed settlers like us! He shook hands with all the men, smiled at all the women (“He seems rather shy,” they said), won confidence and every vote in the district. He served as Member of Parliament for many years. Election day arrived, and our parents, excited and exhilarated, rushed through their morning chores. We all changed into our Sunday clothes. Mother carefully heated her curling iron over the coals in the wood stove and made my little sister and I fluffy, pretty curls. Then off to the schoolhouse again we went, two and a half hours away by horses and wagon. Mother and Father sang, and little Sister and I rejoiced, without fully understanding what the happiness was all about. “Really Mother, you ought to make melted curls more often!” We listened incredulously, then “Tatochku, you’re teasing us,” we giggled, and our parents laughed. The holiday mood of election day was dampened but not destroyed. At the schoolhouse, at last, the atmosphere was pleasant, formal, and serious. It felt rather like the church services held there three or four times a year when visiting clergy came, but without the flowers and incense and lovely singing. Father and Mother did something quiet and mysterious with pieces of paper while we watched from the back of the room. As Gloria Atamanenko explains in her story, “I was born near Fort Vermillion, Alberta, 100 miles below the Northwest Territories boundary, the farthest north farming district on the continent.” Her family immigrated to Alberta in the 30s, built a small cabin, farmed, hunted, and trapped for a living, a childhood time she remembers with great fondness. As a young woman in the 50s, she became a social worker by profession and lives presently on a ranch with her faithful husband in BC near 150 Mile. Note: Original article appeared in Lived Experience volume number seven. Copies are available at The Station House Gallery and The Open Book in Williams Lake. Gloria’s articles appeared in LE 7, 8, 9, and 10. Fifteen annual LEs are available at both places, or can be ordered from the publisher at vanandruss@gmail.com.